Auxiliary generator armature at Bowers At this stage other than removal little work had been undertaken on the Auxiliary Armature. 4th December 2008. 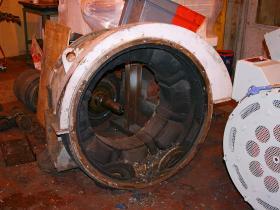 At this stage other than removal little work had been undertaken on the Auxiliary Armature. 4th December 2008. ETH armature and field windings at Bowers The brush box end of the ETH generator body is seen showing the field windings following initial cleaning of the unit. 4th December 2008. 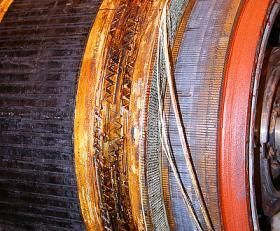 The brush box end of the ETH generator body is seen showing the field windings following initial cleaning of the unit. 4th December 2008. ETH armature slight banding damage Unfortunately when removed from the field windings, the ETH armature banding was found to be suffering from the effects of old age, and showed slight damage and weakening. 4th December 2008. Unfortunately when removed from the field windings, the ETH armature banding was found to be suffering from the effects of old age, and showed slight damage and weakening. 4th December 2008. ETH generator overhaul at Bowers ETH Field windings had also had some initial cleaning undertaken and are seen alongside the Armature, the long shaft protruding toward the camera is the mounting for the Auxiliary Armature which had been removed. 4th December 2008. ETH Field windings had also had some initial cleaning undertaken and are seen alongside the Armature, the long shaft protruding toward the camera is the mounting for the Auxiliary Armature which had been removed. 4th December 2008. Spare ETH and auxiliary armatures at Bowers Other work undertaken was to strip the poorer generator set, check all of the components, and to enable any parts to be cannibalised off this set if necessary. 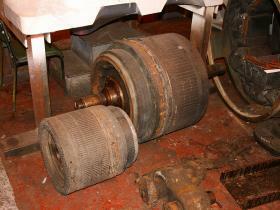 Here the two armatures are seen, Auxiliary to the left and damaged ETH to the right. 4th December 2008. Other work undertaken was to strip the poorer generator set, check all of the components, and to enable any parts to be cannibalised off this set if necessary. 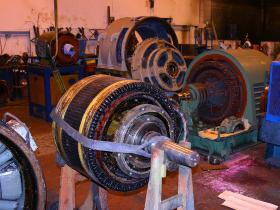 Here the two armatures are seen, Auxiliary to the left and damaged ETH to the right. 4th December 2008. Spare ETH armature showing damage This picture shows a closer view of the damaged ETH armature. 4th December 2008. 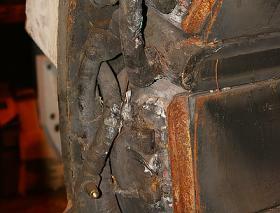 This picture shows a closer view of the damaged ETH armature. 4th December 2008. Spare ETH field winding case damage This view shows the condition of the field windings on the poorer of the ETH Generators and some of the damage that it has suffered. 4th December 2008. 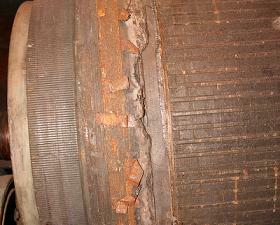 This view shows the condition of the field windings on the poorer of the ETH Generators and some of the damage that it has suffered. 4th December 2008. Spare ETH field windings case at Bowers The fan end of the poorer ETH Generator showing the sooty condition of the internals. This generator is the worst of the generators that will eventually be needed for Renown, the good news is that repair is possible. 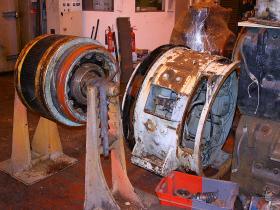 We have since purchased a much better condition ETH generator for Renown which will be coupled with a good condition ex-Class 37 auxiliary generator but the set pictured is retained as a repairable spare. 4th December 2008. 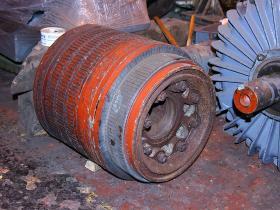 The fan end of the poorer ETH Generator showing the sooty condition of the internals. This generator is the worst of the generators that will eventually be needed for Renown, the good news is that repair is possible. 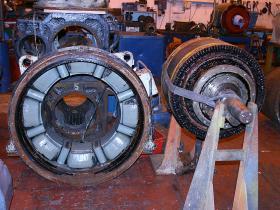 We have since purchased a much better condition ETH generator for Renown which will be coupled with a good condition ex-Class 37 auxiliary generator but the set pictured is retained as a repairable spare. 4th December 2008.